The appropriate word here would probably be “busted.””My Prius went wild!” guy Jim Sikes apparently didn’t realise his car carried the equivalent of an airliner’s Black Box. Ah, well. Live and learn, Jim. In the Big House. 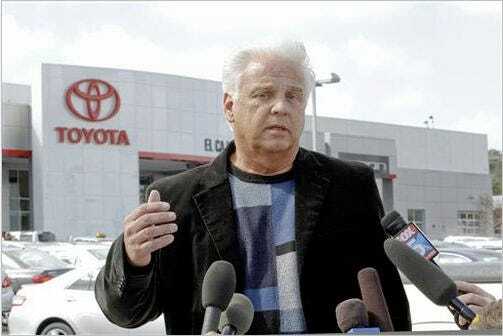 Alexandra Berzon and Kate Linebaugh, WSJ: Toyota Motor Corp. said Monday there are “significant inconsistencies” between a California man’s account of how his Prius hybrid accelerated out of control last week and the car maker’s preliminary investigation of the vehicle. The driver, James Sikes, said he applied heavy pressure to the brake pedal while the car traveled at high speeds in an attempt to stop it. But Toyota disputed that account. “We believe the vehicle was being driven with the front brakes lightly applied,” Bob Waltz, Toyota’s U.S. vice president for product, quality and service support, said at a press conference in San Diego. Mr. Waltz said data captured by the car indicated that the brakes and accelerator were depressed about 250 different times during the incident.